Party Rounds in Seeds - Just Getting Started or Has the Clock Struck Midnight? Party rounds symbolized the heyday of the startup seed market just a last year. Called parties because of the number of investors who collaboratively financed seed rounds of startups, the lists became almost comically long as seed sizes ballooned and investor syndicates swelled with them. 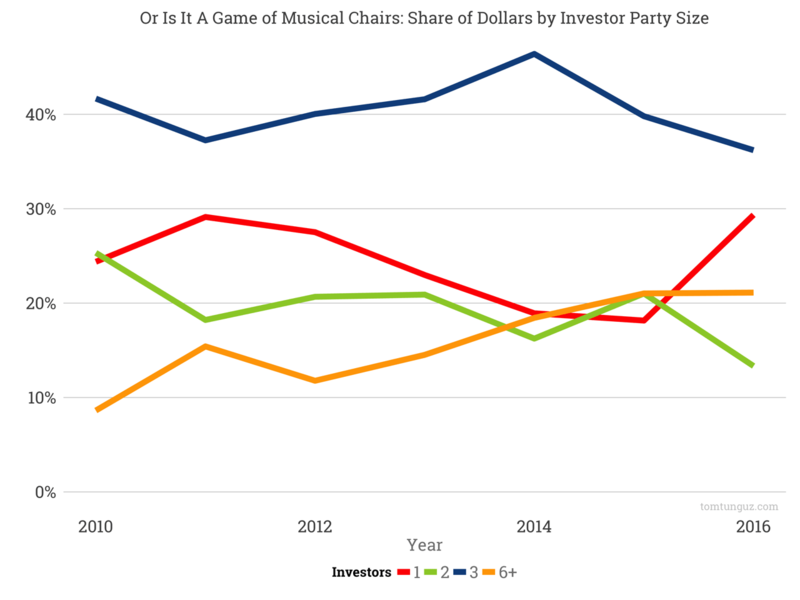 Recently, I have heard from founders that they are less interested in party rounds, but does the data support the case? The chart above plots the percentage of seed investments for US startups by the number of investors in their seed round. I have bucketed the data by investor count: one investor in red, two investors in green, three to five investors in blue, and six-plus investors in orange. The fraction of seed rounds with one investor has eroded its 2012 high of 35% to 28%. The share of seeds with two investors has declined from the 2010 high of 26% to 20%. Meanwhile, the share of seed rounds with three or more investors has increased by 10%. 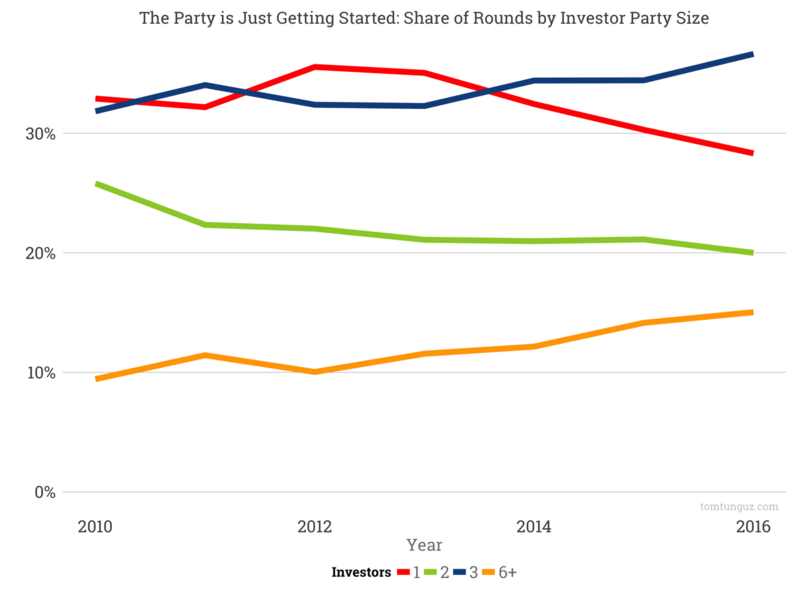 Party rounds are becoming increasingly common in number than they have been in the last five years. However, dollar trends contradict round count trends. Single investor seed rounds’ share of dollars invested have spiked from 19% to just under 30% of dollars, taking share from rounds with 3-6 investors. This pattern is consistent with a previous analysis that showed a decline in seed round counts, but a substantial increase in round sizes. Some investors have changed their strategy preferring to claim the entirety of the round, rather than hosting a party. I suspect this trend is buoyed by a change in venture firms’ seed strategy. Three or four years ago, VCs were investing broadly and sparsely. Today, seed investment by venture capitalists seems more concentrated, though further analysis is required to substantiate that hypothesis. The seed market is in flux, and there are forces moving in opposition. The total number of seeds has fallen, round sizes have increased substantially. There are more party rounds, but those rounds tend to be smaller. Bigger seed rounds have one investor supplying the capital, likely a manifestation of new seed strategies by bigger funds.